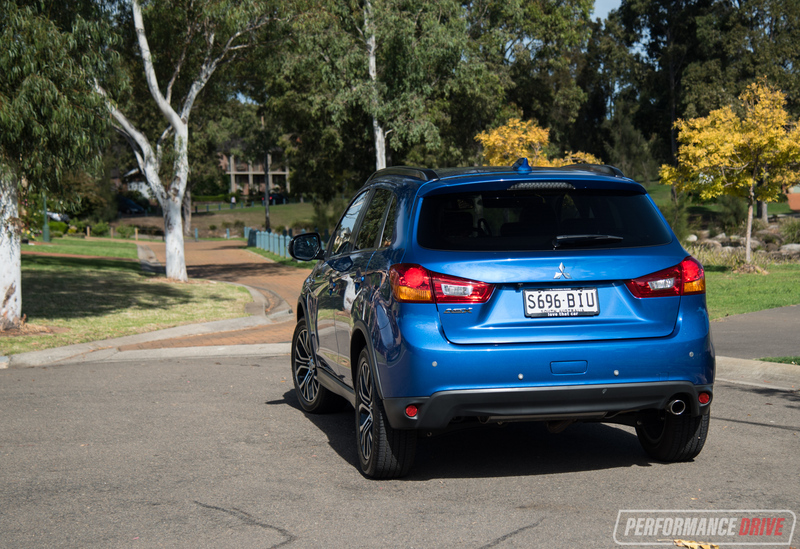 Mitsubishi may no longer cater to traditional fans (such as the Evo brigade) like it once did, but one of its best decisions has got to be the launch of the ASX in 2010. 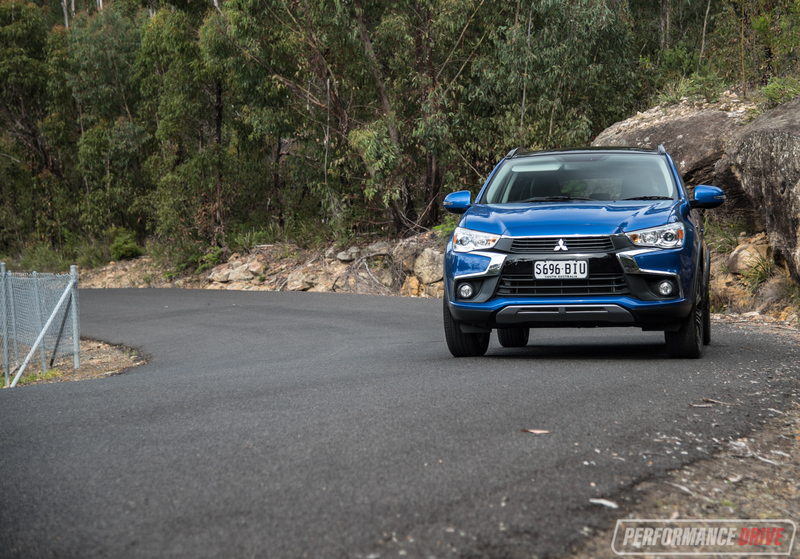 Despite being one of the older designs in a segment it helped pioneer, the 2017 Mitsubishi ASX is anchored near the top of the popularity chart, selling 6792 units so far this year (through May), making it the second most popular contender behind the CX-3 (7292). 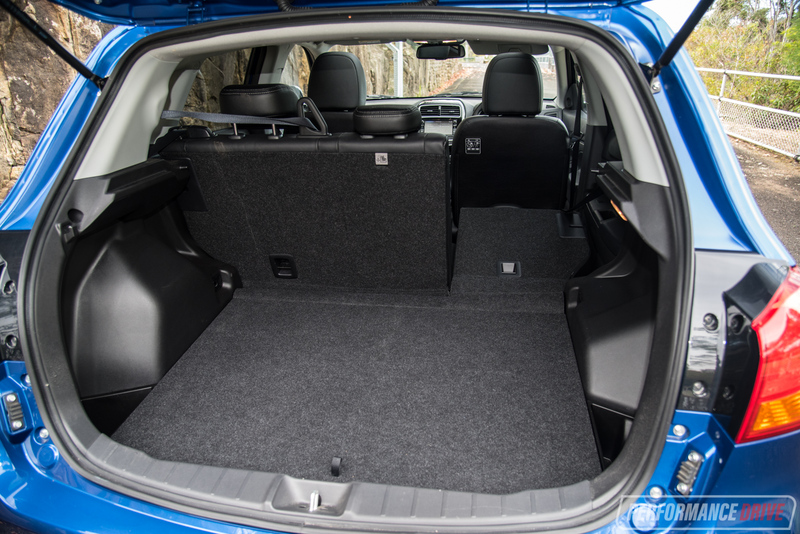 It regularly scuffles for class honours with the Mazda CX-3 each month. 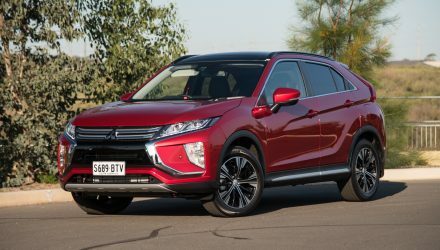 For the car to be doing this well seven years into its life means Mitsubishi chose the right segment and the right ingredients. 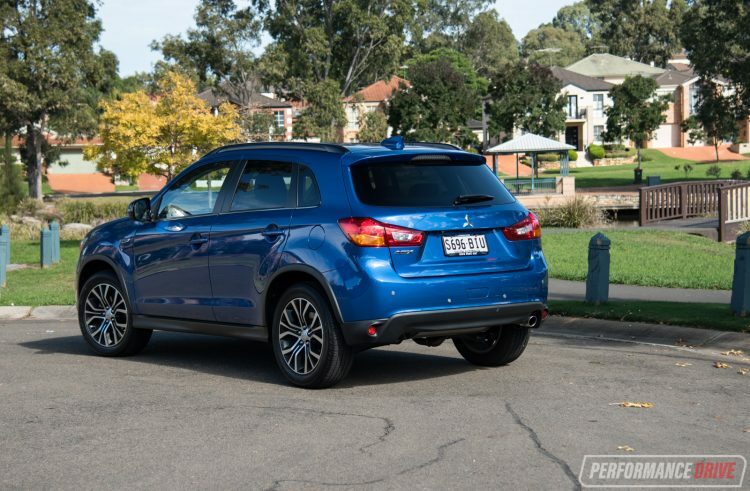 New for 2017, the ASX receives some mild updates to keep it going. These include Euro 5 compliance for the 110kW/197Nm 2.0 petrol and 110kW/360Nm 2.2 turbo-diesel, fettled seat controls, new trim, light infotainment upgrades, and Mitsubishi’s new ‘Dynamic Shield’ chrome grille surround. 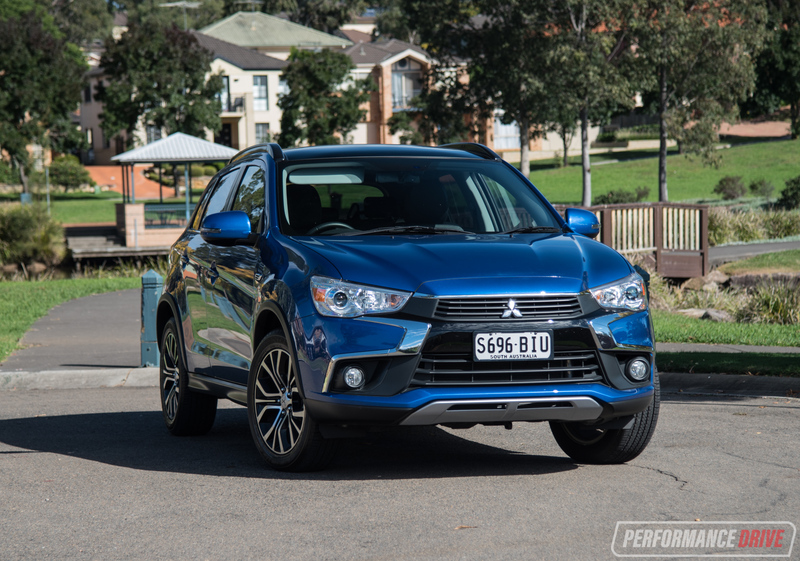 With a flurry of new small SUVs now on the market, how does the ASX compare? 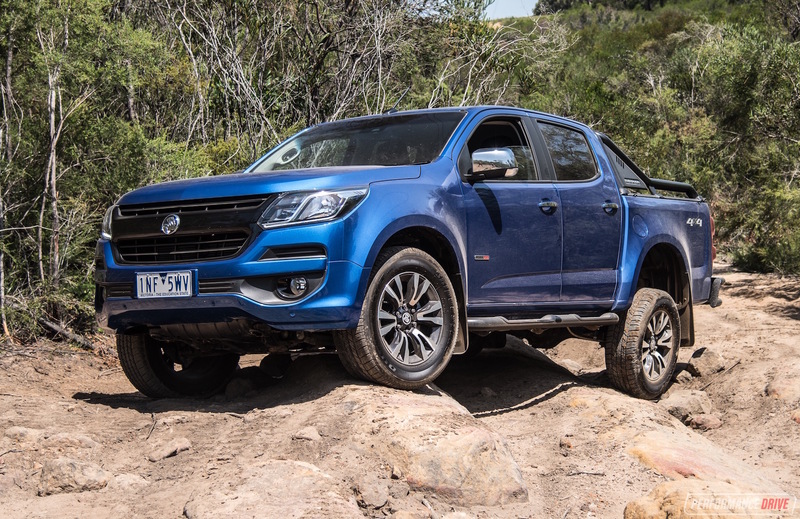 We’re testing the upper-spec XLS variant, in petrol 2WD guise, which retails from $31,500 (excluding on-roads). 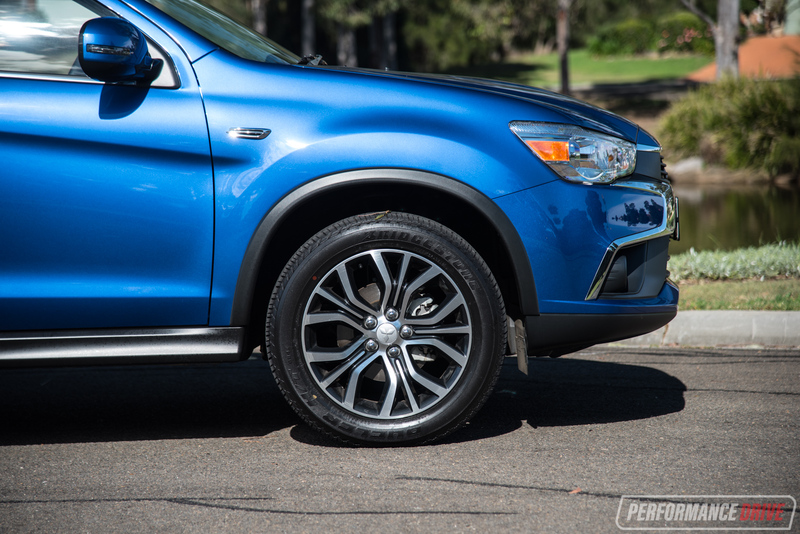 The ASX is an orthodox, tall-body small SUV of 4355mm length, 1810mm width and 1640mm height, on a 2670mm wheelbase. 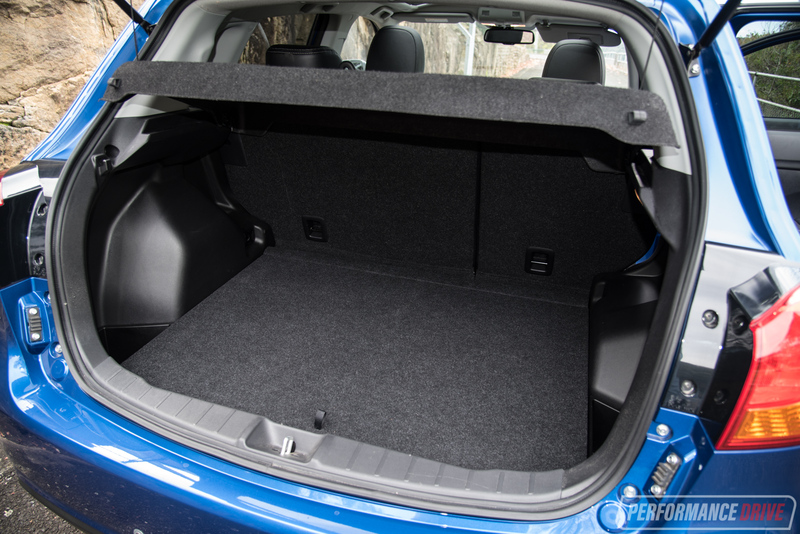 Boot space is 393L with the seats up or 1143L with them folded down. 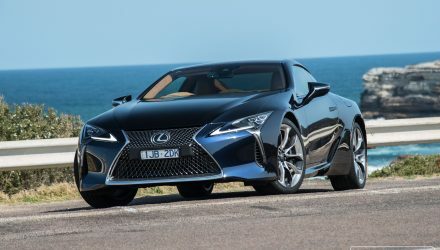 Specification highlights for the XLS include a panoramic glass roof, leather trim, heated seats, 18-inch alloys and cruise control. 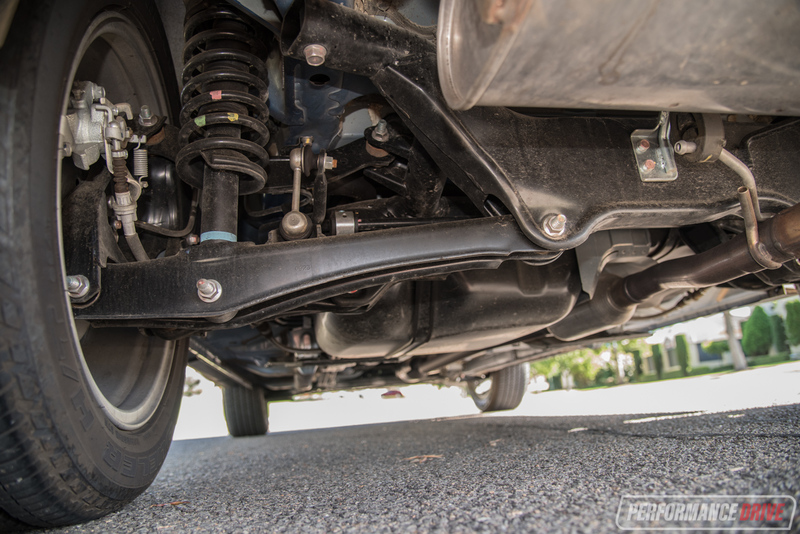 It is a familiar sight on our roads, due to its vintage, but is neither cutting edge nor overly stale. 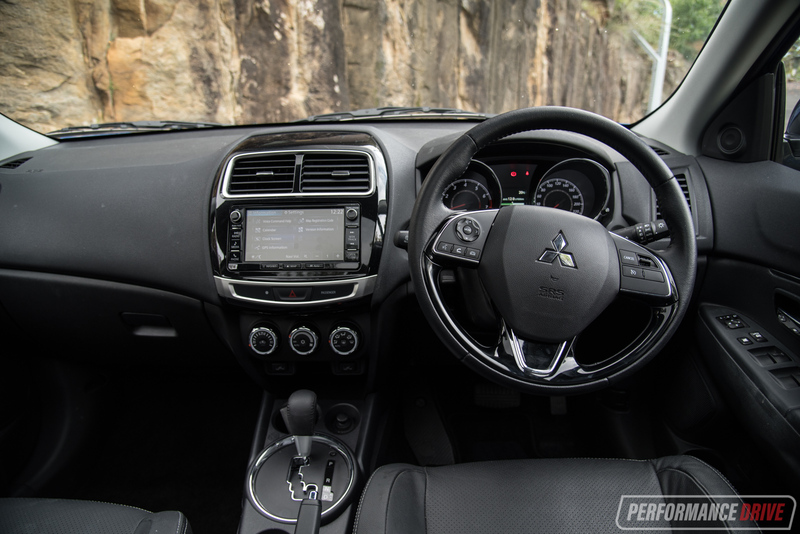 The exterior has design elements that hark back to the 2007 Lancer with the company’s new motif overlaid in an attempt at modernisation. 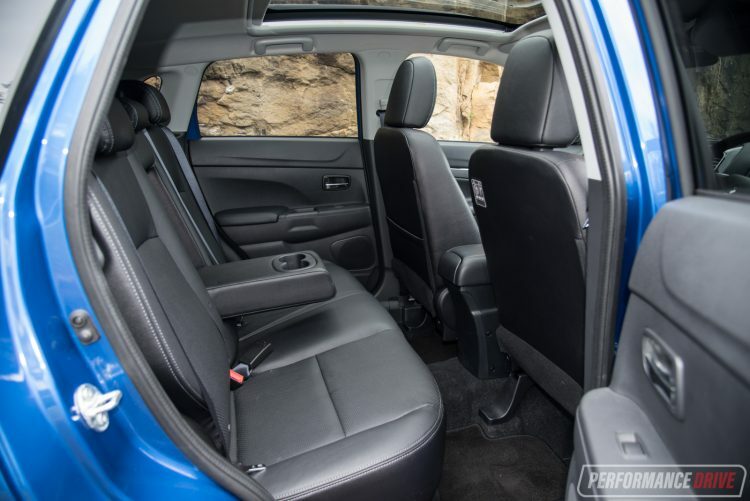 Step inside and you find a roomy and well laid-out interior. 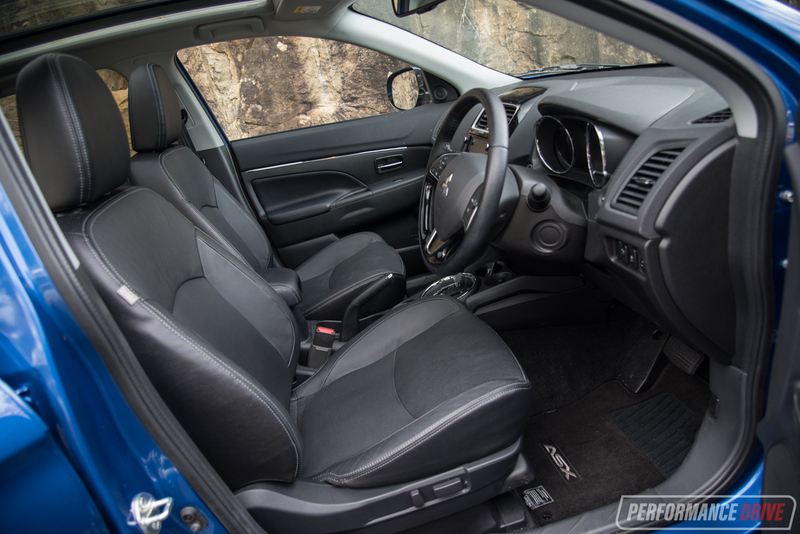 The steering wheel is a good size and feels right, and window, infotainment and all major controls fall readily to hand. 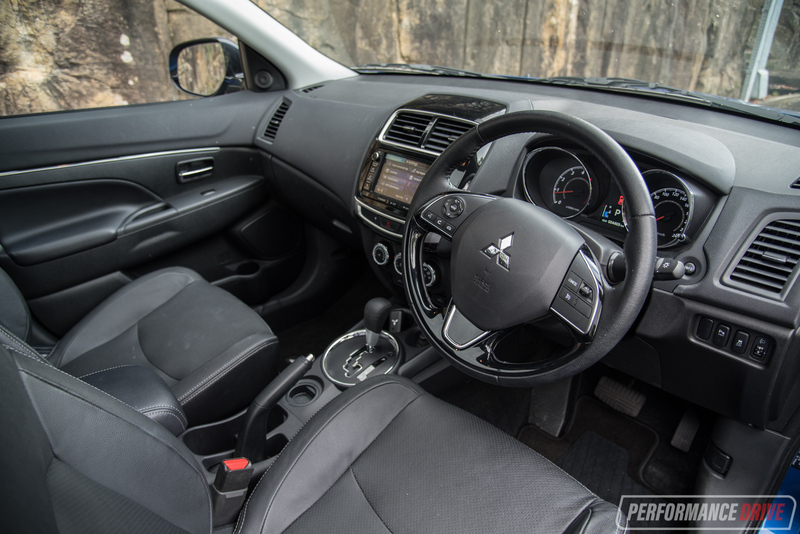 Fit and finish is excellent and this does feel like a car that will stand the test of time, as Mitsubishi’s five-year/100,000km warranty boldly attests. It must be said, though, that the choice of materials is acceptable at best, not premium quality. There is a chrome strip on the inner door trims that feels 1980s but there is something charming about that. 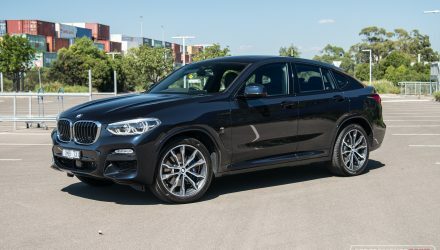 Climate control is via three knobs with no digital display and an ‘auto’ function where ‘off’ should be, but there is nothing wrong with its ability to heat or cool the air in the cabin. 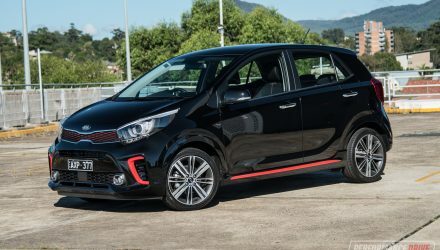 The infotainment system is adequate in performance, with no smartphone mirroring but there is Bluetooth, digital radio and a CD player. 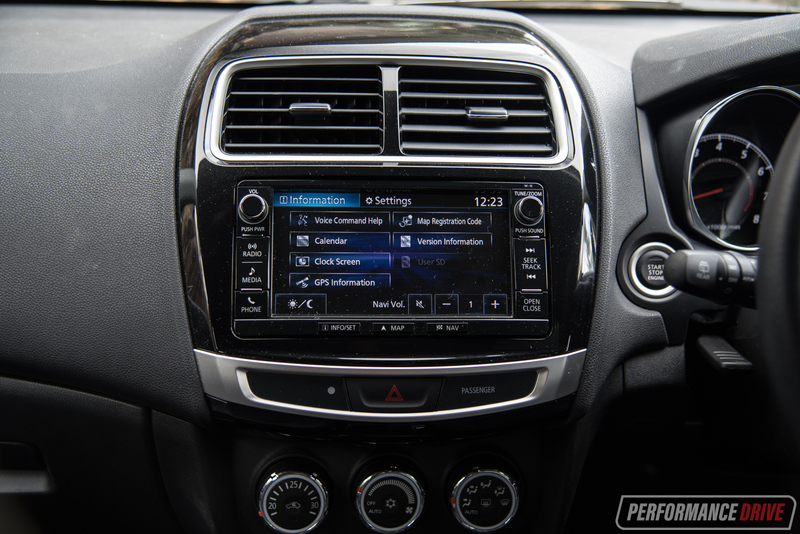 Audio performance is rather decent, but being the flagship, a Rockford Fosgate system with a big subwoofer like top-spec Outlanders should be here, we feel. Satellite navigation and reverse camera are mostly good, but both suffer a slow boot-up and refresh rate compared with systems on newer rivals, despite the recent update. Out on the open road, the ASX still shames a few of its newer adversaries (ahem, Holden Trax), with its nimble yet relaxing steering feel, decent refinement and good ride. 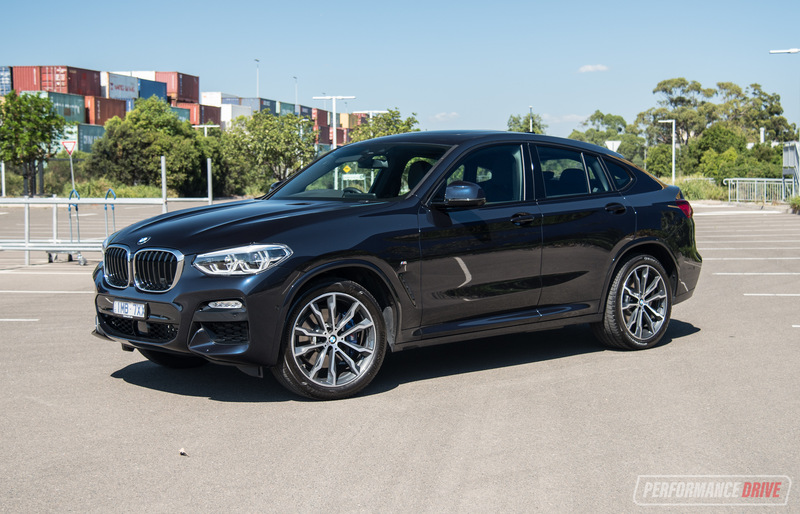 The 2.0-litre engine is mated to a CVT-type automatic, which can be droney and doughy in many cars, with an elastic feel, but the ASX doesn’t feel afflicted by these problems. 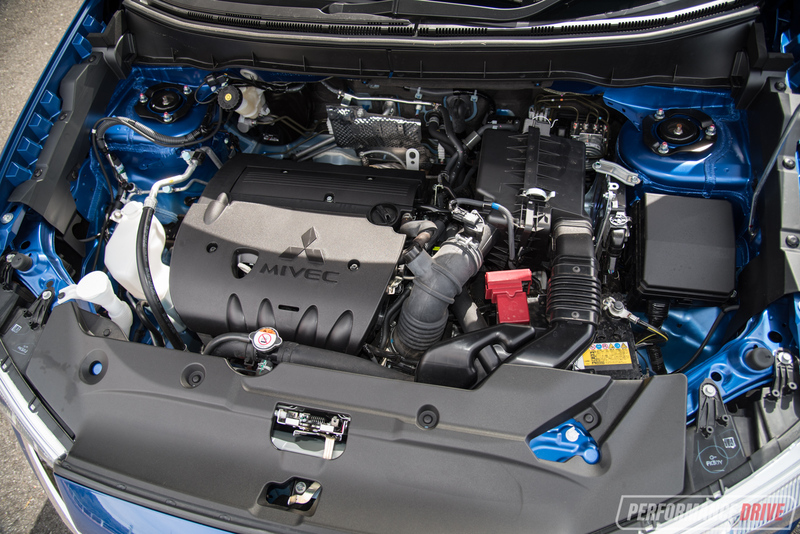 A small, city-oriented car like this suits the gearbox and Mitsubishi has masked the typical flaws that normally affect CVT automatics. 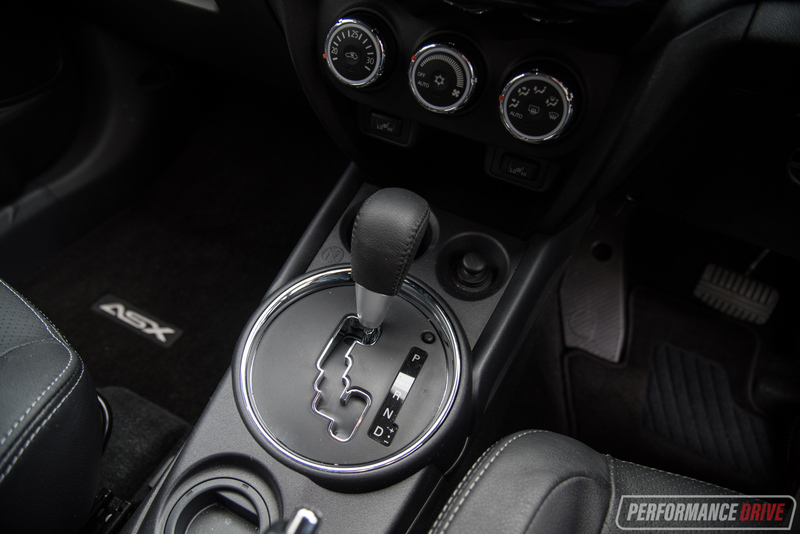 Throttle response is decent, and it keeps the engine on the boil when you give it a bootful, and it doesn’t jerk or hesitate. 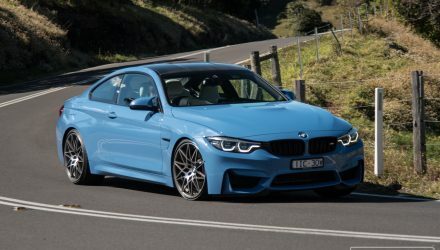 Performance is neither spirited nor sparkling, but it never feels slow. We timed 0-100km/h in a respectable 9.62 seconds. 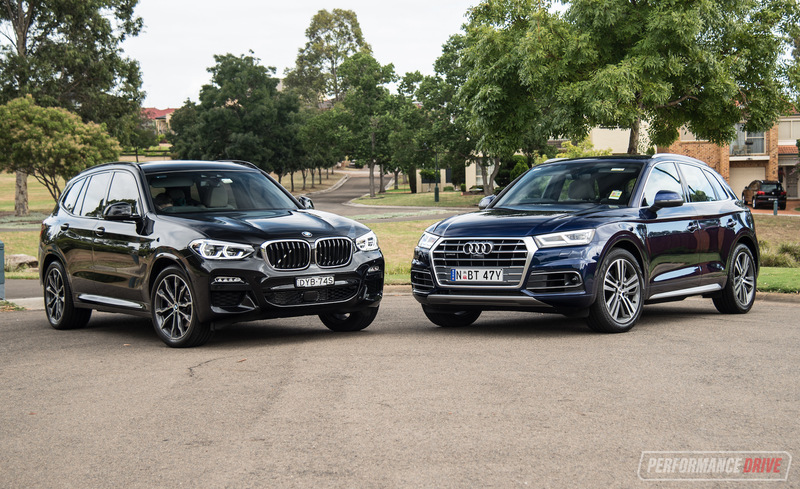 A fuel efficiency rating of 7.6L/100km is middle-of-the-road, and in the real world you can expect around 8.0L/100km, as was the case during its playdate with PD; we always like a car that can stay within spitting distance of official claims, which is something downsized and turbocharged rivals can seldom manage. 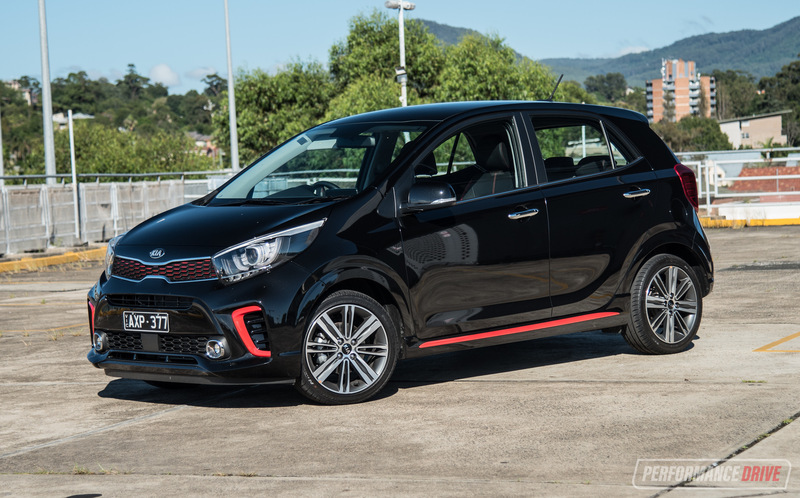 The AWD-only diesel version is quoted at 6.0L/100km, for the record. 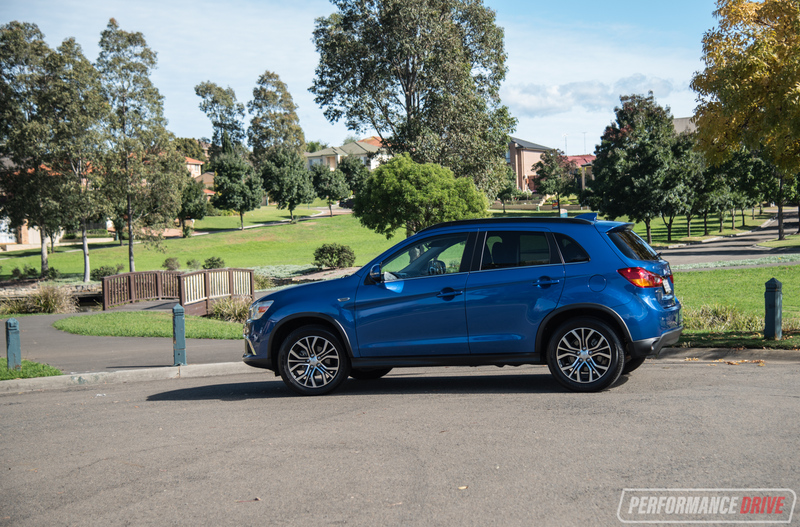 ASX’s tall driving position inspires confidence in traffic and the parking lot, where it allies with light steering and parking sensors to help even the most anxious parker. 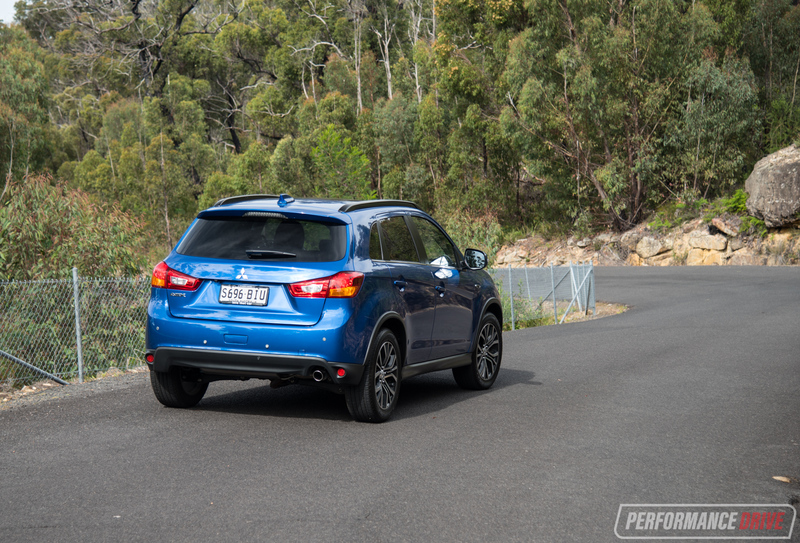 On the limit, the ASX’s behaviour is predictable and chassis balance is pretty good. 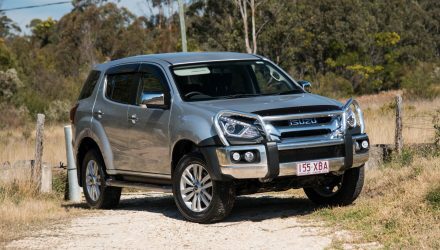 The stability control will kill any danger or most fun before it happens, but that’s fine for most people hunting in this class. 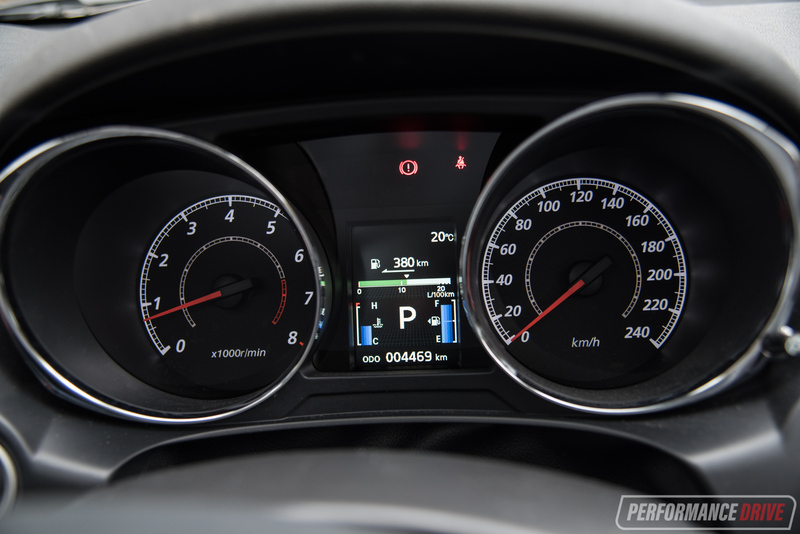 In summary, it is not particularly entertaining or engaging – a Mazda CX-3 will better suit enthusiastic drivers – but the ASX’s personality encompasses ease of driving with mildly pleasant steering feel. 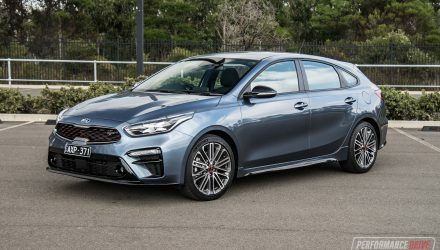 It’s tall driving position, orthodoxy and user-friendly controls mean it would be well-suited to an elderly person, but that’s selling short its broad-ranging appeal. 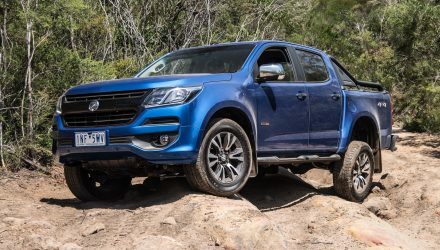 The ASX was a master stroke for the company and like the Triton and Pajero Sport, one of the few gems left in the range before the company was snatched up by Nissan. 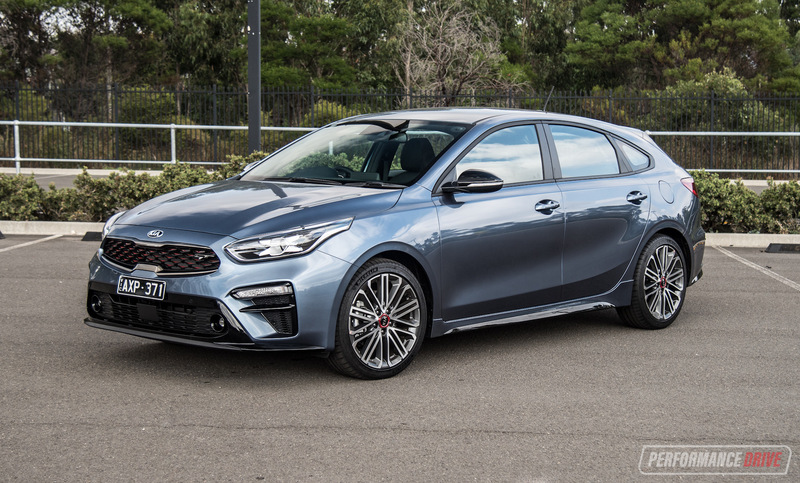 Soon it will be joined by the Eclipse Sport and several models that will benefit from the Nissan-Renault parts bin, probably including the successor to this car. 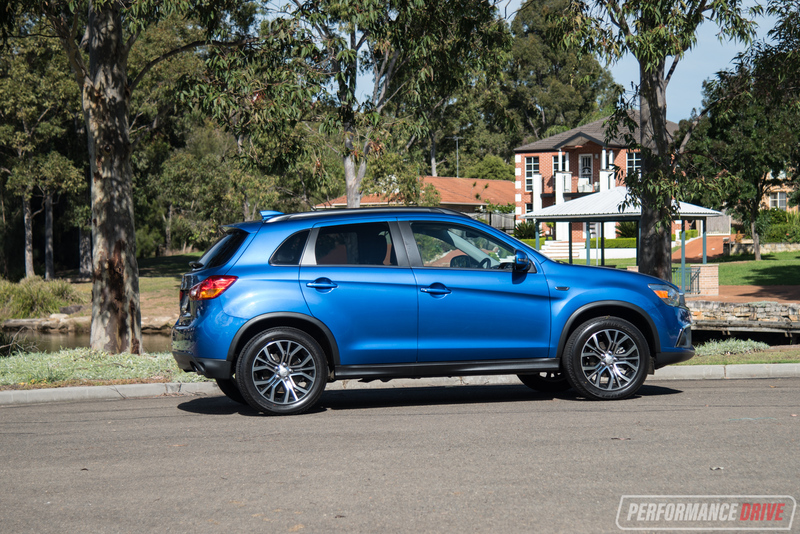 While there’s nothing particularly exciting about the ASX, it continues to work very well and is a trusty little unit.